I don’t always go to the gym (who am I kidding, I do! ), and when I do – I always have a Polar Heart Rate Monitor on to track my progress. Brand new to the Polar game is the Polar A300 Heart Rate Monitor, which will not only track your progress in the gym, but it will also track your real-life progress metrics outside the gym. Now what is this I’m going on and on about. Out of gym progress (at least as far as I’m concerned) revolves around daily activity levels (training and otherwise), sleep patterns, calories burned, and all that other fun stuff that happens outside the gym. Essentially, the A300 combines those features you’ve come to know and love in all Polar HRM models with all the handy metrics captured by the Polar loop. The A300 lets you change the color of your unit, whenever you want. You can purchase different colors straps, separately! A300 not only tells me what zone I’m in when I’m training, calories burned, training time, etc, it will also tell me how many steps I’ve taken in a day, how many calories I’ve burned overall, and even how much restful sleep I got in an evening. I could go all technical on you and tell you the how, but I’m more interested in talking about the why. A300 helps you perform optimally, both in and out of the gym. It ensures you’re always moving (the watch will vibrate to remind you that you haven’t moved in a while), tells you how much rest you’re getting (rest is crucial to performance and recovery, you know), and tracks all your vital gym metrics in any way you want (you can go online to the Polar training page to set custom metrics displayed, whenever you want). All in all, I’m a HUGE fan of the new Polar A300. 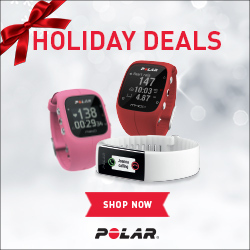 Get yours today, from Polar.